This cleaner/degreaser/disinfectant from Clorox Commercial Solutions quickly removes grease, grime, food stains and other oil-based dirt from hard, nonporous surfaces. 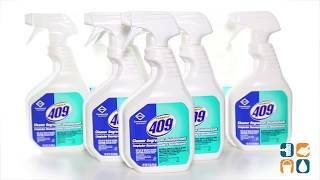 Powerful cleaning done naturally, Formula 409 contains 98% Naturally derived ingredients. Safe on multiple surfaces, including counters, appliances, stainless steel, sealed granite, chrome, sinks and toilets. Ideal for use in commercial kitchens, schools, offices, day care centers & other business facilities. Recognized by the EPA Design for the Environment program, these products are never tested on animals. Each carton includes 12 - 32-oz. Trigger Spray Bottles. Call today to order. Buy more and save!